This beautiful full-color book teaches you the basics and beyond to get started with the delicate and feminine art of embroidery! In years gone by, the art of embroidery was taught to young ladies from an early age. Whether to teach a daughter, granddaughter, a group of girls, or yourself...the clear photos and descriptions will have you stitching hope chest treasures, gifts, & little items for around the home. 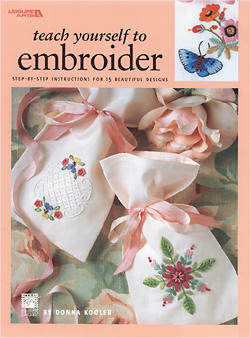 Covers history, tools and stitches of embroidery, nine projects, and a variety of designs! Beginner to experienced. Softcover, 56 pages.